With gifts delivered and the reindeer put out to pasture, Santa's on his Harley and headed for the shore. 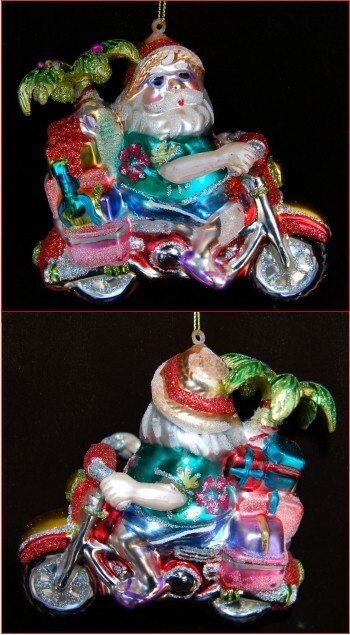 The beachbound Santa motorcycle personalized Christmas ornament displays amazing detail and a ton of tropical color on both sides that will brighten any holiday season. This upscale glass ornament is perfect for those who spend Christmas where the sun dances on ocean waves...or just wish they did! We'll include our convenient cord for hanging the Santa on a motorcycle personalized Christmas ornament wherever it brings the most pleasure.